It is said that the reasons for study of the history of lineages is not in order to guard one's caste and birth like a Brahmin but so that one can accumulate immense merit through the reading of the lives of the great masters and be inspired by their activities. The origin of the Nyö lineage dates back to a very long time ago in Tibet much before the spread of Buddhism there. It is said that at a time when Tibet had just been settled, one dawn on the mountain of Jomo Kharag in Tsang, people saw a handsome, young man in white descend. Possessing all the qualities of a deva, he radiated with light and had a very peaceful aspect. No one knew him or had seen him before, no one understood his language, but because of his radiant and wondrous appearance, they bore him on their shoulders and revered him as a celestial being. The humans called him Jachung Karpo or White Garuda. This was because he was very majestic and beautiful to look upon and had flown down to earth. He was a deva from the deva realms but due to the close proximity with humans who were enthralled with him and kept him surrounded at all times, this devaputra (son of devas) became tainted by mi grib or drib of humans and couldn't return back to his deva realm. He is described as having been slightly "intoxicated" by human defilements and thus the descendants born from Ja Chung Karpo (the White Garuda of Nyö) were called Nyö. The Tibetan word smyos is derived from the original word myos. The word myos literally means intoxicated and smyos means crazy in the literal sense. Since then many members of the Nyö lineage have also been described as demonstrating crazy wisdom and many mahasiddhalike activities and have therefore added to the multi layered meaning and organ of the word Nyö (smyos) in the name of the lineage. Nyö Jachung Karpo married the princess of rmu, Ding Mo Tsün Shö (rmu lcam ding mo btsun bshos), who was herself a wisdom dakini and their descendents were called the Nyö and the lineage was thereafter known as Palden Nyörig or the Glorious Nyö lineage. Below is the Nyo linage untill Lhanangpa. Nyo Gyalwa Lhanangpa Sanggye Raychen (gnyos rgyal ba lha nang pa sangs rgyas rys chen) was the only child of both of his two parents, he had two half brothers and two half sisters. His father was Nyo Dragpa Pal (gnyos grags pa dpal), one of the four most powerful and wealthy men in Central Tibet in those times. He was not only wealthy but a religious person as well, a bearer of the special Guhyasamaja lineage that came from his famous great-grandfather Nyo Lotsawa Jungpo Yonten Drag (gnyos lo tsa ba 'byung po yon tan grags), Marpa's traveling companion in India. Dragpa Pal, although a layman, often gave Guhyasamaja teachings and initiations to monks. On these occasions, his son Lhanangpa, then known as Zibji Pal (gzi brjid dpal), would sit on his lap and be the first to receive the empowerments. 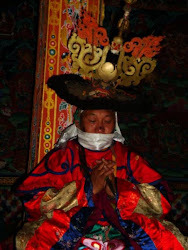 Once he went with his father to Gungtang (gung thang) to visit the famous Zhang Yudragpa. Zhang identified him as a reincarnation of the Great Siddha of India known by the name Krishnacharya, in Tibetan Nagpo Chopa (nag po spyod pa). It is said that during his childhood games, Lhanangpa was the one to decide who would play elephant and who would play horse, who would play the minister of exterior, the minister of interior and the general. The other children could not play as they wished, but had to ask his permission first. He made up the rules of the games, and anyone who violated them would no longer be welcomed as his playmate. Clearly, this story is meant to display his born leadership abilities, but it equally conveys the sense of entitlement that often comes with privileged birth. As a teenager, he felt a burning desire to follow the example of his illustrious ancestor and become a translator. Knowing that India was a very hot country, he performed yogic exercises that could help to withstand the heat. He thought that if he were to die, it would have to be in India. While he was still planning his India trip, at age nineteen, he met Jigten Gonpo ('jig rten mgon po) and immediately perceived him to be nothing less than a real Buddha. Jigten Gonpo ordered him to go to another place to receive complete monk ordination, which he did in 1190. On his arrival at Drigung ('bri gung), he spent seven years in solitary meditation inside a sealed hut. Then he went to Tsari, which was only at that time opening up as a place for meditation, for five more years of retreat. Tsari is a wild place of outstanding natural beauty located near the border of Assam. He spent many more years in still other secluded retreat places, included Mount Kailash, where he earned his title Lhanangpa (lha nang pa) late in his life after the name of a place where he meditated. He would never succeed in reaching India, although he did eventually visit Nepal. His father, as his dying wish, requested that the skull-cup that had once belonged to Naropa, passed on in the family for generations and its most treasured possession, should be presented to Jigten Gonpo. Soon afterward, both of Lhanangpa's half brothers died, as did a number of other important members of his clan. Much of the family wealth was then donated to Drigung Til and Pagmodru. Lhanangpa was most famous during his times for his lavish brown sugar feasts (bur ston chen po), which became proverbial for their generosity. Although these were religious gatherings, and the offerings included much more than sugar, in those times cane sugar of the dark brown kind known as jaggery was a highly valued luxury item which had to be imported all the way from India. At the largest and latest of his sugar feasts, held soon after Jigten Gonpo's death in 1217, 55,525 followers of the Drigungpa were in attendance. Quite late in his life, in about 1219, he founded a monastery named Lhatel Rinchen Ling (lha thel rin chen gling) where his disciples gathered to hear his teachings. His most famous miracle occurred at Lake Mapam (mtsho ma pham), where he went to visit the under-water palace of the naga king, and then surfaced in the center of the lake sitting cross-legged. This miracle was seen not only by his followers, but by all the nomads encamped around the lake as well. He was said to have arrived Bhutan in 1194, where he established Chelkha Monastery which later known as Chelkha dzong and stayed for 11 years according to some histories. His followers and his minor drkung subject known as Lhapa remained stronghold for long time until it lost to the Drukpa Kaguye and formed number of dzongs which i suppose are those dzongs of Dongoen dzong, Jathel dzonn etc. After having returned back to tibet, late some year before his death, he he returned back to Lhokha Zhi (lho kha bzhi) in search of the place where Sumthrang Lhakhang is found following the prophecy of his Great Master Drikung Jigten Sumgoen.He travelled via Monlakarchung mountain into Bumthang and reached the location passing through Choekhor toe and Tang valley. Establishment of this monastery sowed the seed of Nyo linage in Bhutan where many elite personals such as the linage of Pemalingpa originated.